The magic remains in English or French. 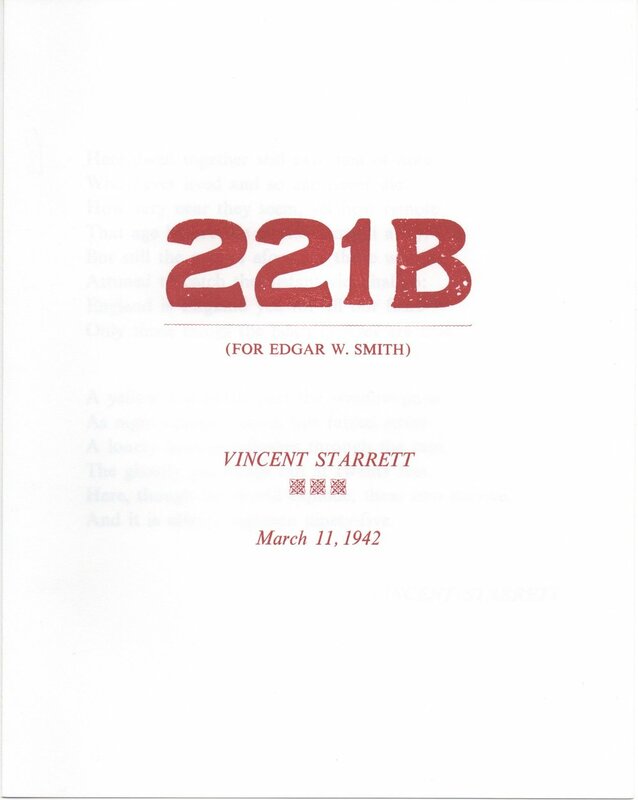 The cover of a new publication of Vincent Starrett's immortal sonnet, "221B"
If you know anything at all about Vincent Starrett, the chances are you know his sonnet, "221B." Written in the midst of World War II and dedicated to fellow Baker Street Irregular Edgar W. Smith, Starrett poured all his affection for Holmes and his Victorian world into those brief lines. Since it's first publication in 1942, the poem has been endlessly reprinted, repeated at Sherlockian functions around the world and translated into more than a dozen languages by young Holmes fans who appreciate the nostalgia and longing these lines evoke. 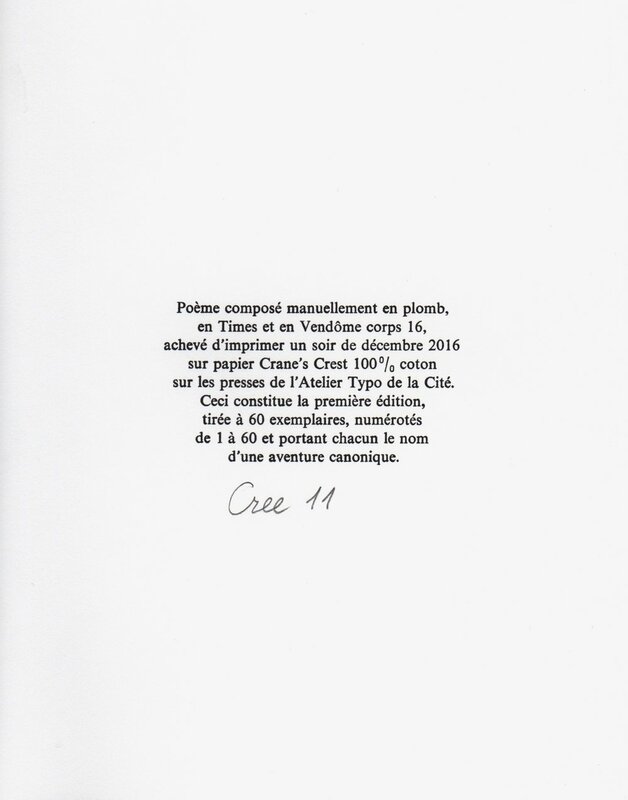 Regamey's company is Atelier Typographique de la Cité and Sonia kindly sent me a copy of his work. It is a masterpiece of printing and truly a work of love. The press uses techniques from the last century to print beautiful postcards, notebooks business cards and other documents. This printing of "221B" is no exception. The cover is above, and this is one occasion when my scans do not do it justice. The gold embossed house number, door knocker, knob and mail slot bounce off the page as if lit from inside. The cover page itself is milk chocolate brown and Starrett's name is more distinct than the scan shows. Inside are three snow white loose sheets, each measuring 14.25 X 9.25 inches and folded in half. Here are the six printed pages. The poem was composed using lead type with the Times and Vendome 16-point typefaces families. The paper is Crane's Crest 100 percent cotton. It was completed in December 2016 in a limited run of a canonical 60. Each copy is numbered and relates to the name of a Holmes adventure. This one is linked to "The Adventure of the Creeping Man" and is No. 11. This is a truly impressive piece all 'round, from the translation to the care taken in the printing. Hand printed items are rare these days and Regamey is to be thanked for keeping this fine old craft alive. Starrett would have been impressed with the final result. I want to thank Sonia Yazmadjian for contacting me and sending along this truly beautiful piece. It will have a place of honor on my shelves.